SHULLSBURG/BENTON’S Trevor Kattre (right) gets a hand on the plate before Wiota catcher Tyler Osterday can apply the tag during Sunday’s game in Benton. 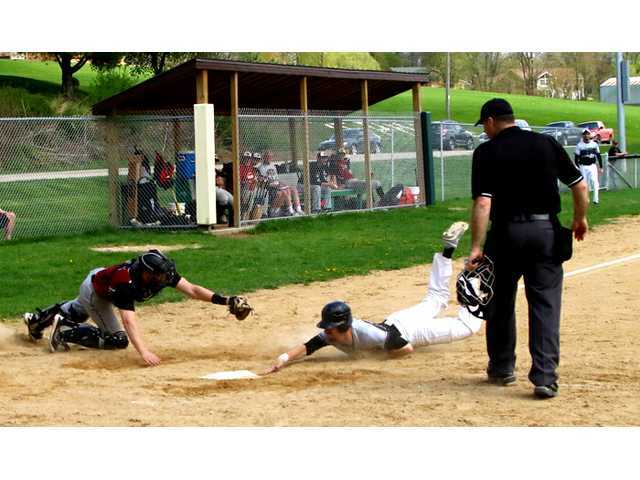 POSTED May 10, 2018 10:04 a.m.
BENTON – Four Shullsburg/Benton players drove in two runs apiece to lead the host Fever over the visiting Wiota Indians, 9-3, in a Home Talent League Western Section South Division Sunday League baseball game played at Benton’s Swift Park on Sunday, May 6. First baseman Jacob Green ripped a solo home run in the first inning for the Fever (2-0 SL), while catcher Trevor Kattre had a two-run double in the seventh inning and Jake Marshall added a two-run double in the eighth. Shortstop Joe Cox drove in runs in the seventh and eighth as well for the hosts. DH Rooney Janecke went 2-for-3 with a double, a RBI and a run for Wiota, and third baseman Hayden Hardyman had two hits with a double and a run for the Indians (1-1). Justin Crotty (2-0) earned the win for the Fever after allowing a run on four hits and three walks with seven strikeouts over seven strong innings of work. Wiota’s Ben Conway (0-1) fanned eight and walked just one over six and a third innings in the loss. The Indians stay on the road next week with a Sunday League game at Dodgeville, while the Fever hit the road for the first time this season to face West Middleton on May 13. Both games are set to start at 1 p.m. Leading Hitters: W- Rooney Janecke 2x3, Hayden Hardyman 2x3. 2B– Janecke, Hardyman. S/B- Joe Cox 2x5, Jacob Green 2x4. HR– Green. 2B– Trevor Kattre, Jake Marshall. W- Justin Crotty (7IP, 4H, 1R, 1ER, 7K, 3BB). L- Ben Conway (6.33IP, 8H, 6R, 5ER, 8K, 1BB).